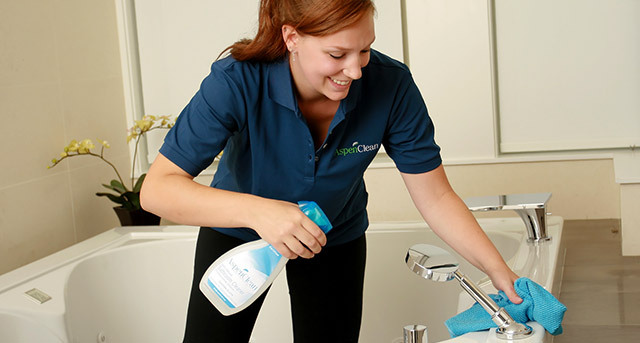 Guest blog post by our Value-Added Partner, Aspen Clean. “Your cell phone contains more bacteria than the toilet seat.” is an oft-coined phrase designed to scare you into buying a bottle of disinfectant that guarantees to send 100% of germs into oblivion. Not all bacteria is bad bacteria, though, and spraying every last household item with a bottle of chemical-based cleaning product to remove germs is a surefire way to toxify your home and negatively impact the health of both you and the planet. We like to think of our bathtubs and showers as some of the cleaner spots in our home. It might be surprising, then, to learn that the bath is of the dirtiest. All kinds of germs fester on tubs, especially around the drain and knobs, and even in pipes. A recent study found that 81% of Whirlpool tubs contained fungi and 34% contained staphylococcus bacteria. Spray and rinse the bathtub regularly using an all-natural cleaner. Be particularly vigilant if you’re using your tub for bathing and not just showering. For tough deposits of grime, try AspenClean’s unique Superscrub Powder to make cleaning easier. Germs are nothing if not stubborn. Every night you eat dinner and wipe down the dining room table, you’re leaving behind germs in the one place so many of us forget to clean. The salt and pepper shakers might seem harmless enough, but they are one of the most common places for cold viruses and other germs to change hands. Multiple recent studies suggest a direct link between seasoning shakers and contracting a cold. Yet they remain one of least-cleaned and therefore dirtiest places in any home. Wipe down your salt and pepper shakers every time you clean off the table. The only other solution is saying no when asked to pass the salt, but let’s face it, we all like a little seasoning on our plates! Another popular household item that the whole family touches on a daily bases is the TV remote. What’s more, it’s likely someone will use the remote while handling food such as pizza without utensils. This results in germs on the floor, on the table, in front of the television and in between couch cushions. Remotes quickly become greasy germ havens and, because they’re electronic, they don’t get cleaned as often as they should. The same rules apply for video game remotes as well! A quick spray and wipe between the buttons on a weekly basis or every time you host a pizza party or have guests over. Just be careful not to use too much solution or you could damage the electronics inside. As an additional precaution, it’s also a good idea to wash your hands after using the remote, especially if you don’t know where it’s been! Like your remote, the keyboard and mouse of your computer are often shared by multiple people. A family computer is used even more than the television in most homes, and is placed closer to your face and hands for longer periods of continual use. Sneezing, eating, drinking, coughing and more all take place in front of the computer, and those cracks between the keyboard and mouse are some of the grimiest places in your home. Try using a very small amount of the All-In-One Concentrated Cleaner on a cue tip or microfiber cloth to clean in between the keyboard cracks. But before you do that, turn over your keyboard and shake to release any trapped particles of crumbs or dust. To clean grime off your computer’s screen, use some natural glass cleaner with a smooth microfiber cloth. The sink might seem like one of the cleaner places, especially since you use it to clean your dishes. However, bacteria and germs actually love the damp and moist surface. It’s amazing how often we just use our sinks for rinsing dishes, which leaves behind even more E. Coli bacteria and salmonella. These germs fester, and multiply off food particles left behind by cleaning and rinsing plates. It’s crucial to keep your sink clean every day. Sanitize your sink with our Kitchen Cleaner, which is formulated to fight grease and kill bacteria without the use of bleach. 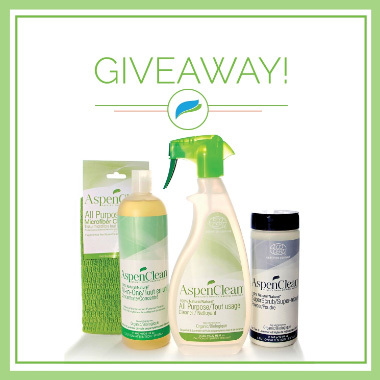 AspenClean is giving away an All Purpose Cleaning Set to one lucky winner! This fantastic bundle includes a range of our all-natural, Ecocert certified cleaning products that contain zero chemicals, just pure organic essential oils. It’s everything you need to clean all areas of your home. Visit the Aspen Clean contest page and enter your details to win! Contest ends March 6th, 2017!